Hello everyone! It's been a long time! My last post was in February, and even I'm like what happened there?! Well, to be fair, final year happened, and I'm sure you've all heard the horror stories(!) I was snowed under with coursework and job applications, and when I thought I could catch up with blogging, summer exams suddenly came around a lot faster than I was expecting. I know everyone says time flies, but it truly does! I finished my last exam a while ago (yay), and it's still sinking in that my University experience is over. I might do a blog post on it when I've figured out just what to say. So moving on, a few months ago I popped into TK Maxx (you know how I love finding me some cheap Dune bags! ), and I popped over to the beauty section. 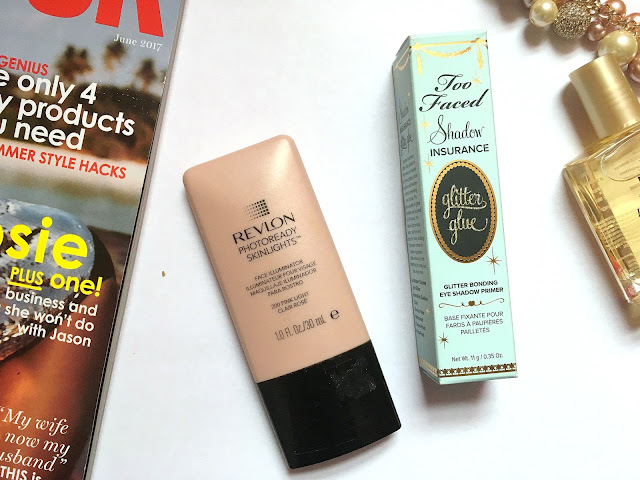 I ended up picking up a Revlon highlighter (I was feeling a bit left out on the highlighter craze), and a Too Faced glitter primer. 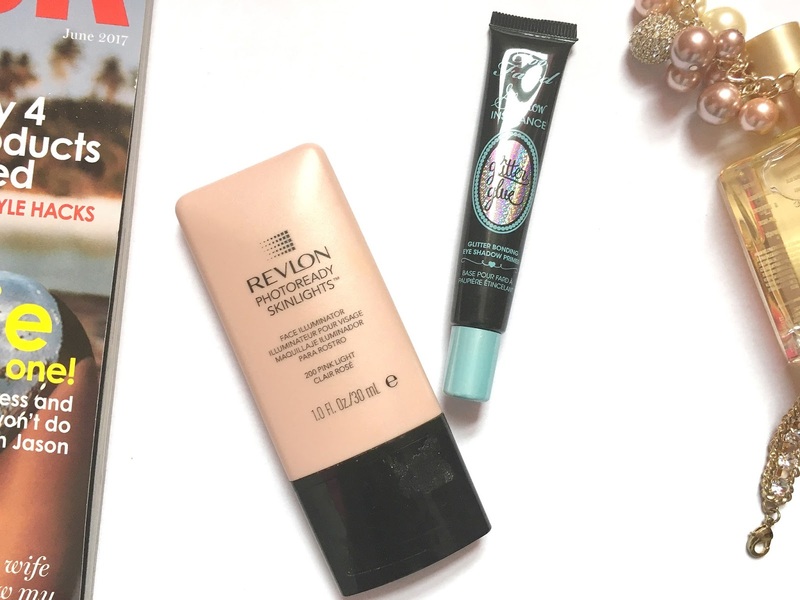 The Revlon Highlighter I picked up is the PhotoReady Skinlights Face Illuminator in 200 Pink Light. There were only 3 shades available in TK Maxx, the other two being 300 Peach Light and 400 Bronze Light. These shades were noticeably a lot warmer, so I thought they wouldn't work with my neutral undertones, and I went with 200 for £4. However, when I got home I realised Pink Light is infact quite cool toned and the slight pink shade does come through, but luckily if I apply a light layer (which is all you need), it sort of works. Although, I'm not sure if it would work on warm undertones (100/300 would work much better for you). The highlighter is one of those multi-use products that could be used under your foundation, mixed into your foundation or over it. I rarely wear foundation daily so I often use this with a paired back, simple concealer and lipstick look, to add some shine. The highlighter is a liquid formula but at the same time I wouldn't say it's too runny either, and you really need to blend it into your skin to give a seamless look. It gives off a lovely sheen, although there are very fine glitter particles in it, so honestly a little bit does go a long way (although thats totally up to you!). In terms of application, I think you do need a good skincare base as I did find that it can stick to dry areas or look a bit patchy. I prefer working a product like this in, so I tend to use my fingers or a beauty blender. With the beauty blender it disperses the product a bit, giving a lovely overall glow. However, using your fingers gives a more precise application and it really makes my cheekbones pop if I focus it on the semi circle from the bottom of my eyebrow to my cheekbone. You also need to be a bit fast working this product in, but it's definitely worth it. It wears well throughout the day as well. I don't think they still sell this line on Revlon counters anymore, however you can still find it online. Also, be careful, if you squeeze it too tightly, it will go everywhere! 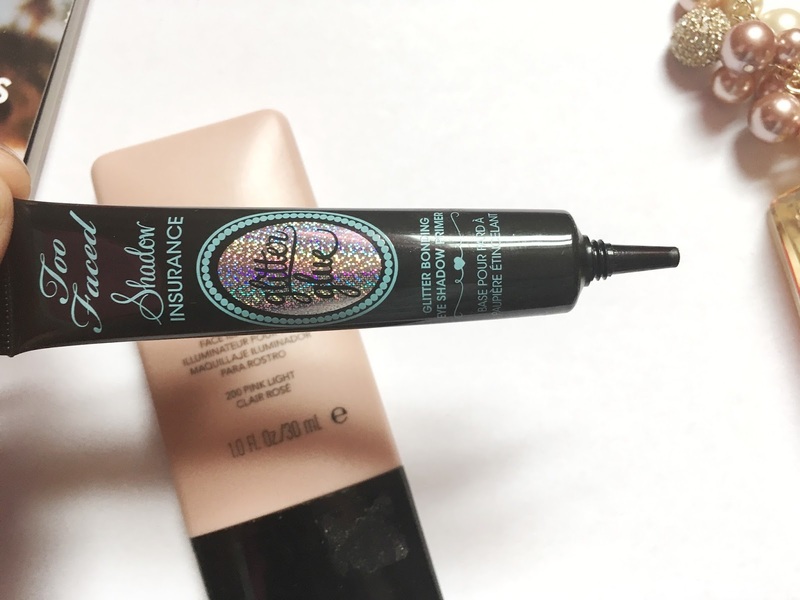 The second product I picked up was the Too Faced Shadow Insurance Glitter Glue. At first, I thought I had hit the jackpot and it was their original primer potion (which is raved about), but it's more for locking down glitters and pigments. I still picked it up because I wanted to play around with pigments anyway for a wedding look. The Glitter Glue is meant to even out skin tone and soften any fine lines. It does definitely do that as it has a slight skintone colour that provides a nice base, however it is quite tacky so you have to quickly work it in and spread it out, and it will soften any lines before it sets. It can't, however, be used as a substitute for the original primer as the tacky base will make any blending very difficult! You then have to press your pigment/loose eyeshadow over it. This step isn't so difficult, even for an amateur like me, and the difference is really noticeable! It definitely exemplifies the eyeshadow and really makes it pop (as you can see on the image below). 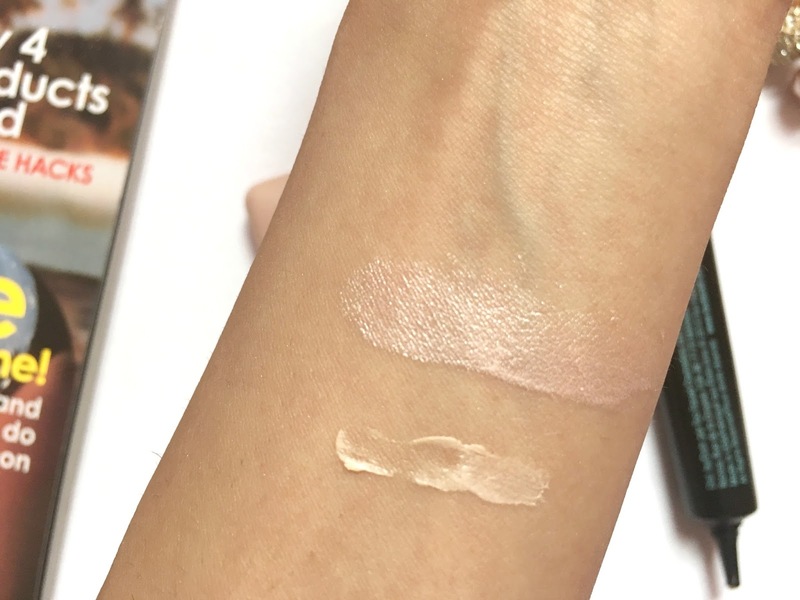 However, the bad news is that in terms of it being a primer, I didn't really see much in the way of it extending the wear time of my eyeshadow compared to any other primer. By the end of the day, whilst the gold pigment was still very much popping, it did sort of melt into the rest of the look. It really depends on what you want from it though and how much use you would get out of it. I'm still quite happy with it as I don't have anything similar to wear underneath my pigments, and I got it for quite a good price of £6. The RRP on Debenhams's is £17 (here), which is much higher. However, it could be an updated version as the packaging is different to mine. I hope you enjoyed this pot! Instead of a general question, I want to ask what have you been up to lately? Aaaaaw congrats on completing school. Well come to adulthood hahaha! Hopefully you get a job soon, send out lots of resumes & try out internship programmes too :) I like the eye shadow primer packaging. I'm a sucker for anything that's pretty. Great post they look lovely! Congrats on finishing university, girlie! I know you must feel so happy and accomplished, it's such a great feeling! As for these products, I'm familiar with the Revlon highlighter, many seem to really love it, I've yet to try it myself. Thanks for sharing and I hope you're having a great week so far! Welcome back. I know life sometimes gets in the way of blogging. Congrats girl. I love the look of the highlighter. That highlighter looks lovely :) i'll definitely check it out. Wow, it really does make a difference! Need to try. I'm not really a big highlighter kind of gal so creams are my favourite. I've been eyeing up the Too Faced shadow insurance for ages now but I cannot bring myself to pay the price for it, it's basically just glue for your eyelids but so expensive! You got it for really cheap and it looks like it has done an amazing job! Welcome back and good to see a new post from you! Congratulations on finishing uni too, I bet it's a relief! The glitter glue sounds really cute, I haven't got any two faced products! Now I want to try out the highlighter! Congratulation for finishing your university last exam, good luck for the future. I haven't tried these both products and they sound good. Oh, the glitter glue sounds amazing! Love the with/without difference in your swatches. And congrats on finishing uni!! I treasure these times. Enjoy the graduation and best of luck with everything! I've always been interested in the too faced shadow insurance - although the glitter one is news to me! There is absoloutely no doubt it really makes such a difference with eye shadow although you really do want it to help your shadow last a lot longer really! That Revlon highlighter looks so pretty! I don't wear a lot of glittery eyeshadows, but the glitter glue makes it super pigmented! I love it! As for how I'm doing, I've been loving my new apartment and being a newlywed for about 2 and a half months! Revlon just recently came back to Germany (recently as in three days ago), so I am searching the web for recommendations. The highlighter will not be my first pick, I am just not into highlighters in general. I still see that Revlon Photo Ready in some Revlon outlet stores in my country, and their prices are slashed. But they're no longer around the main Revlon counters. Glad to see you back blogging! The revlon highlighter looks gorgeous and you can't beat TK Maxx for a bargain! 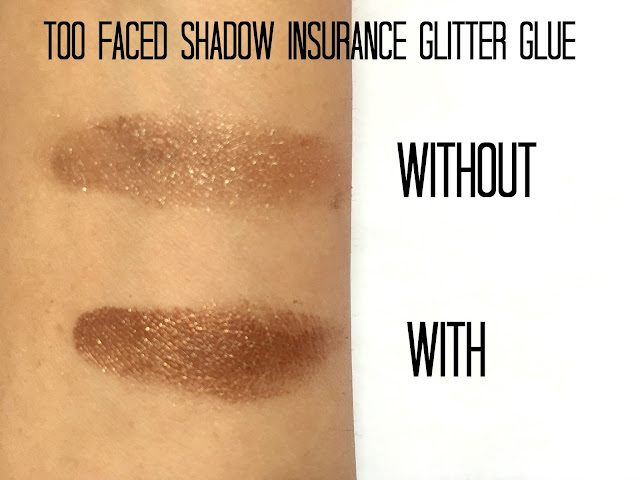 Wow I can't believe the difference between with and without the shadow insurance! I need to get my hands on it!